Carsharing: A Vehicle for Sustainable Mobility in Emerging Markets? Growing from 6 operators in 2012 to 41 by mid-2015, carsharing is rapidly expanding in emerging markets worldwide. What is the future of carsharing? What impact will this innovation have on cities? What are the key challenges for ensuring that carsharing becomes a vehicle for sustainable mobility? This four-part series from TheCityFix draws on new research from WRI Ross Center for Sustainable Cities, exploring and unpacking what carsharing means for cities of the future. Carsharing is rapidly on the rise in emerging markets like China, India, Brazil and Mexico, and shows promise of replacing car ownership for many households. However, entrepreneurs and policy makers must tackle critical barriers to enable carsharing to grow and succeed. A new study published today by WRI Ross Center for Sustainable Cities reveals these findings. When we began the study in 2011, there was little real-world carsharing experience in emerging markets. Indeed, although emerging markets accounted for 72 percent of the world’s urban population, they represented less than 1 percent of all carsharing members—leaving some major questions. What were the barriers? Could carsharing work? Who would use the service? And how would it impact mobility and the environment? We set out to tackle these questions. Over four years, we interviewed dozens of experts and operators, meticulously tracked new start-ups and closures, and convened 14 focus groups of potential users in emerging markets. The results surprised even us. A Driver of Sustainable Mobility? Perhaps the most interesting result was how carsharing would impact travel habits. In North America, carsharing has been shown to reduce car ownership and driving—as each shared vehicle replaces 9 to 13 privately-owned cars, and members drive about 44 percent fewer kilometers and choose to walk, bike, and take transit more. But emerging markets are different, especially since car ownership rates remain modest in comparison. Only 58 people per 1,000 owned a car in China in 2010, and only 18 per 1,000 in India. In contrast, in the United States this ratio was already about 800 when carsharing was first introduced around 2000. Stepping Stone Scenario: Carsharing would reduce the barrier to accessing a car, pique interest in driving among carless households, and catalyze faster motorization. Low car ownership rates mean most people would simply drive more. Leapfrog Scenario: Carsharing would provide a convenient, affordable, and popular alternative to car ownership, and complement lifestyles of walking, biking, and public transit. Carsharing, if introduced early, would help rapidly developing cities “leapfrog” car ownership. Two striking lessons emerged from focus groups in Hangzhou and Bangalore. First, virtually every participant aspired to own a car as soon as economically feasible. Carsharing, it seemed, would not pique demand for owning cars—the interest was already there. Second, participants expressed great interest in trying the service. About one half of participants in Hangzhou and one third in Bangalore said they would strongly consider delaying or foregoing car purchase plans if carsharing were conveniently available. We think both hypotheses may be true, but in different time frames. Since carless households are attracted to the affordable mobility that these services bring, we think carsharing could increase driving when first introduced. But carsharing shows significant potential to decrease driving in the long term as members stay with the service and delay or give up plans for ownership. Carsharing has been experiencing near-exponential growth over the last few years. Graphic by WRI Ross Center for Sustainable Cities. Emerging markets got a late, slow start in carsharing, beginning when Zazcar in 2009 made São Paolo the world’s 1,000th carsharing city. 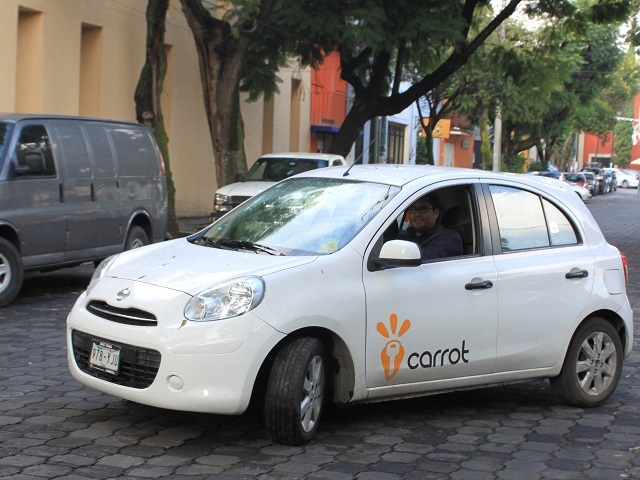 Later, Carrot started up in Mexico City, Yoyo in Istanbul, and others still in Costa Rica and China. Finally in 2012, the number of carsharing companies made a dramatic jump, with over a dozen new start-ups in emerging markets. Since then, an exponential growth curve has pointed steeply upward. By mid-2015, we observed 22 start-ups operating more than 9,200 vehicles in seven countries, serving about 898,000 members. The increase in the past year has been remarkable—about 75 percent of this growth occurred in 2014 alone. China now accounts for one in every seven carsharing members worldwide, which is about the same proportion as its overall population. Recent start-ups in India, Brazil, Mexico, Malaysia, South Africa, and Turkey have also grown rapidly—faster than their predecessors in established markets of North America, Europe and Australia. This suggests that cities in emerging markets may be ready to embrace carsharing at scale. Even so, we found many barriers to scaling up carsharing in a way that could meaningfully contribute to a sustainable future. For example, in São Paulo, we learned that unpredictable three-hour traffic delays can make it virtually impossible to reliably choose and honor a set return time. In Beijing, China, a carsharing company operated only seven vehicles to serve the city of 20 million people, due to government car-purchase restrictions that also applied to carsharing. Meanwhile in India, a lack of on-street parking regulations in most cities makes it impossible to position carsharing pods in convenient on-street locations. Other barriers include poor complementary walk, bike, and transit systems; competition from very affordable, well-established rickshaw and taxi services; limited market awareness; cultural aspirations for car ownership; and immature financial systems for cashless payment, to name a few. Entrepreneurs are innovating to work around such barriers. For example, phone apps are facilitating cashless payment in China. In Brazilian cities, flexible return times are helping to manage traffic uncertainty. Finally, partnerships with developers are helping to deploy cars close to residents in some Indian cities. Local governments, too, are now partnering with operators to deploy electric vehicles in China or promote the service in Mexico. Still, scaling up carsharing will require more action from governments and entrepreneurs to innovate, measure societal impacts, and tackle policy, market, and transport system barriers. Could the sustainable cities of the future prominently feature shared mobility? Walking, biking, and public transit would account for most trips, while carsharing could become a very popular means of accessing and driving a car for occasional trips that require one. That future seems conceivable to some industry experts. In North America, Bill Ford expects future US car sales to decline due to the “disruptive future” of carsharing and automated cars. Barclays predicts a 40 percent decline in U.S. auto sales by 2040. And PWC anticipates a 20-fold increase in the sharing economy by 2025. In practice, Hangzhou, China, may be an early mover. The city of 8 million people is deploying massive bike-share and carsharing systems, while rapidly expanding its metro and bus lines. With over 70,000 shared bikes already deployed, Hangzhou envisions expanding the system to carry 1 million trips per day. And in 2013, the city announced plans to deploy 100,000 shared electric cars—the first of which have already begun to hit the road. The “shared mobility city” may well be on the horizon. Note: This blog post was originally published on TheCityFix, here, and has been republished, with permission here.